Good morning to all, This is to intimate that our friend Mr. NAGARAJ.T (Age 31) is suffering from a brain hemorrhage and presently admitted in NARAYANA hospital Bangalore. He was admitted in the hospital on 21/6/17 due to high blood pressure around 240/180 mmHg and became unconscious. On 21/6/17 he was supposed to go Chennai from HOSUR for Official work, and he had one more person accompanied. Mr. Nagaraj was on his way to board the bus, all of a sudden he fainted near the steps. 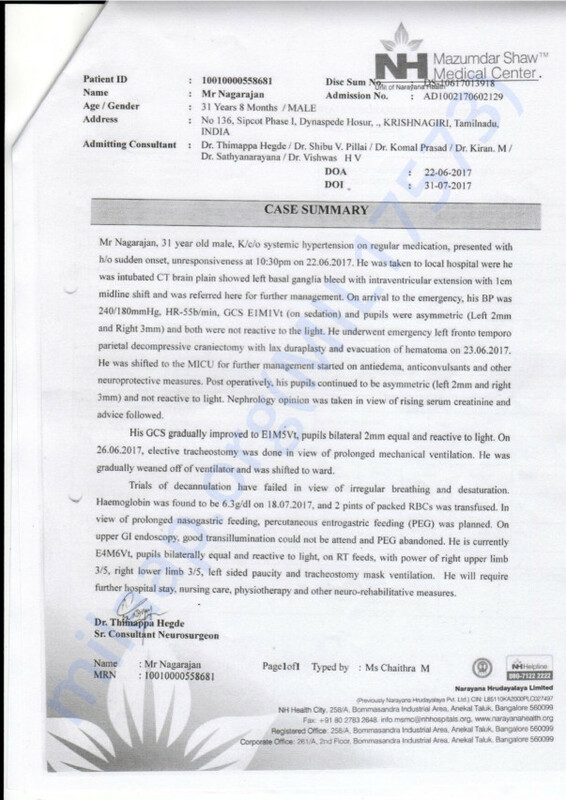 Immediately he was taken to a private hospital in HOSUR, knowing the critical condition of the patient, he was immediately referred to NARAYANA BANGALORE where he had to undergo a brain operation to remove the blood clot that had occurred due to over blood pressure. After the operation, his blood pressure had come to somewhat normal condition. Post operation he couldn’t breathe properly so doctors have recommended to put him under ventilator. 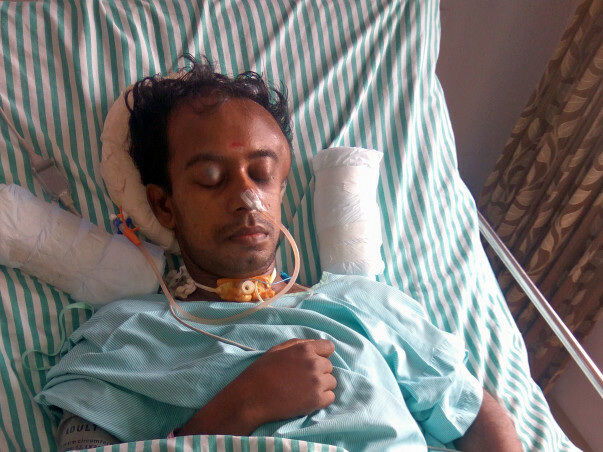 When NAGARAJ was under ventilator he couldn’t see anybody nor sense nor open his eyes he was in a state of coma. After few days he was shifted from MICU to step down ICU. He was kept monitored 24/7 due to inappropriate raise and fall of blood pressure. Later on he was shifted to a ward where he was given medications for BP, low sodium level and was injected with glucose for first 25 days. Some days later we started to give him some pain in his hands and legs, so that he would react back. For the first week he was not able to sense the pain, then later on he started to feel the pain but on only one side. Even now he is not able to identify his neither family members nor colleagues. Now the good news is he is 50percent out of danger but still, 50 percent remains. As of now, he is still in bed being monitored for raise and low of blood pressure. Nagaraj was the only hope to his family, and he is the eldest son of the family. He was the one to take care of two younger sisters & family, since his income was the only hope to them. But now he is admitted in hospital for such a serious condition for the past one month. Mr.Nagaraj family background is financially low and they are not able to pay his medical expenses. Some of our colleagues have raised some funds for the initial treatment. As per Doctor advice for further treatment process would be two major operations which is to be taken care with special equipment & hospitalization. As confirmed by Doctor Major Operations like SKULL operation (Which skull removed from head and has to be replaced back), Throat closer operation (where throat was opened to give the food liquid & has to be closed again). For this above operation and further treatment process we need financial support to recover his health condition. Again his family has to look after to regain him back from this critical situation. As mentioned earlier financially they are low and can’t afford for huge amount. So we request all to support & bring our friend back. As per doctor advice and calculations given by the hospital management it will take around 19 to 20 lacs for overall recovery. Our Nagaraj is discharged from the neuro foundation hospital Salem now and he is proceeding to his hometown. Further improvements are expected only from physiotherapy exercise and this will be carried out by the local nurse at home. He is still unconscious. We will keep you posted. Thank you for all the love and support. Let's pray for further improvements and get him soon. Our friend Mr.Nagarajan has been admitted in Salem hospital. He is undergoing treatment. He is still unconscious and he is able to move only his eyes and hands. The doctors have done his Throat operation. And they have confirmed that they are going to do the skull refit operation at Neuro foundation Salem itself. For his skull refit operation and hospitalization we need financial support for his speedy recovery. As we are all of our friend Mr.Nagaraj has been hospitalized due to Brain Injury. Now he has been shifted to Salem, Neuro Hospital. The doctors have operated him for his Head swelling. Now he is still in the unconsious state. He is not able to speak yet but he can move his hands and open his eyes. He still needs hospitalization and Nursing care and to undergo physiotherapy treatment. Thanks for your help and support. Please do share this campaign further with your friends and family so we may raise funds faster and take him back home. Please keep him in your prayers.